How Much Risk Should You Take Now? How much risk should you take with your investments? How you answer this question will have a tremendous impact on your short-term and long-term financial situation. Keep in mind that even though you have long and short -term financial needs, you also have emotional wants and needs too. If you do not find a balance between these needs and wants, you’re bound to make investment mistakes that could throw your present and future financial life into a tailspin. If you take on too much risk by making very aggressive investments you jeopardize your short-term and long-term financial situation PLUS you rock your emotional well-being as well. If you take on no risk by putting it all into a bank account, you might have a great deal of short-term financial stability and “sleep-at-night” peace of mind. But if you go that route you might be jeopardizing your financial future. And you also might be guaranteeing a future full or worry and anxiety. So you can see that short-term peace of mind may actually create long-term anxiety when it comes to selecting investments that create retirement income. What to do? Everyone has short and long-term financial and emotional needs. Everyone. The first step for you to take is to be very clear about what those different needs are. (It would also be helpful for you to define risk. Most people don’t and that’s another huge error.) In the example above, I put down the answers that I often hear from clients. I suggest you take out a piece of paper right now and duplicate the grid above. Fill it out and see what comes up for you. 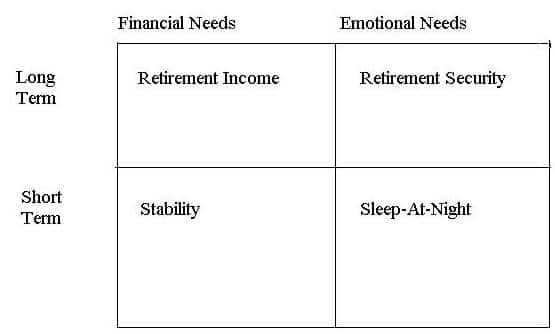 What are your short term emotional needs when it comes to your money? Is it crucial that your accounts never drop in value? Do you feel like your money must be making money every single day? Why do you feel this way? Write it all down. Your answers might be leading you towards keeping all your money in the bank – or under the bed. It’s important to be aware of these internal forces. Next jot down your long-term emotional needs. Do you need to feel you are on track to meet your long-term goals? What has to happen in order for you to feel that you are on track? Write that down as well. Your answer might include needing to have growth in your portfolio. Can you see how your long and short term emotional needs compete and contrast with each other? Do the same thing with your long and short-term financial needs. You will see the conflict there as well. By simply being aware of your various needs you’ll be able to find the proper balance. And you’ll be able to differentiate between your financial needs and wants. Many times people focus on one quadrant and just ignore the other three. You can see what a mistake that is. Here’s another little trick might also help. Think about your long term money in different buckets. Each goal has a different bucket and therefore a (potentially) different investment plan. Let me illustrate this by way of example. I spoke with a Jim yesterday who is very successful. He retired at a young age with a very nice portfolio. He put a large chunk of his assets into real estate and other large amount in a balanced portfolio. His long-term goals were retirement income but he also wanted to leave a large estate for his children. He was very concerned about his situation because the real estate he owned (free and clear) lost a great deal of value over the last 4 years and the balanced portfolio had just gotten back to where it was in 2008. He was worried that he was taking too much risk because of the losses he suffered. But he was also worried about low returns and not making up for lost time. I suggested he re-think his position. First, I pointed out that he might consider leaving the real estate to his children as an estate. It was worth several million dollars – even though it was worth less than it was 4 years ago. The property was throwing off nice income and by the time his children would inherit those properties, the rental real estate would probably be worth multiples of what is was worth today. That helped Jim relax and focus on his portfolio. I reminded Jim of the grid above and we went through it. It turns out that Jim is interested in growth but doesn’t really need to take on a great deal of risk. He has an emotional need for both growth and safety and that is reasonable. But his financial needs were reasonable growth and income. The balanced portfolio makes all the sense in the world – even though it won’t provide ultimate growth and it won’t protect Jim against all downside loss. By becoming aware of his emotional needs and seeing them in proportion, Jim was able to make better decisions about risk. Are you clear about the risks you are taking in your portfolio? Are you conflicted at times?